The Endowment was founded in 2000 by two visionary attorneys to address the growing unmet needs of low-income families and the unpredictable nature of civil legal aid funding. Today, the Endowment for Equal Justice is the largest civil legal aid endowment in the nation, with a corpus in excess of $17 million. Over the last five years, the Endowment has dispersed over $3.2 million to the Legal Foundation of Washington’s grant making pool. While our Constitution affords everyone the right to legal representation in criminal matters, there is no such guarantee for civil legal issues. For far too many low income people in Washington, justice is out of reach. The Endowment for Equal Justice protects people’s safety, dignity and rights by providing a sustainable source of funding for civil legal services they could never afford on their own. We wisely invest private donations from attorneys, law firms, judges and other people who care about equity and justice in a long-term, revenue-producing fund. Then, annual proceeds are distributed through the trusted Legal Foundation of Washington to provide stable, ongoing funding for civil legal aid throughout the state. Because the Endowment’s principal remains intact, revenue from interest will provide an everlasting source of funds that changes people’s lives — a safety net for civil legal aid today and for generations to come. 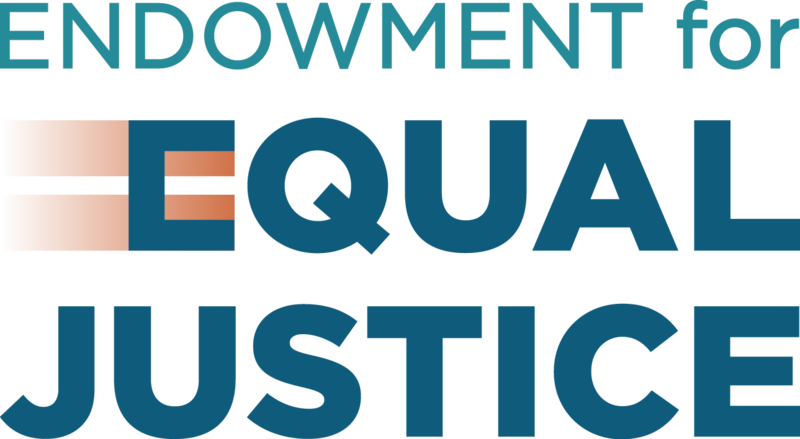 The Endowment for Equal Justice raises, invests and contributes funds to resolve the civil legal aid challenges facing Washington families and to change systems and policies that perpetuate poverty. We envision a day when every individual and family living in poverty and facing a civil legal crisis has access to the help they need thanks to the increasingly larger role the Endowment plays in funding civil legal aid.